Costume jewellery goes back as far as the 1700s and came into the 1930s as a cheap, disposable accessory meant to be worn with a specific outfit, but not meant to be handed down through generations. 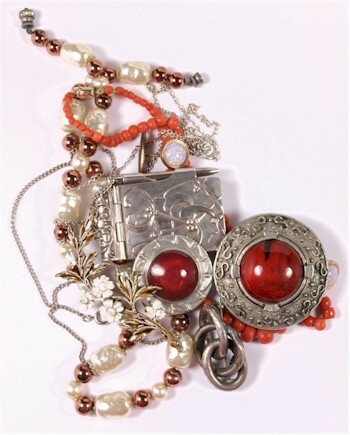 A collection of costume jewellery that is typical of the items sold in our jewellery auctions. Costume jewellery is made from semi-precious materials, base metals and simulated stones that are more affordable than gold or diamond set jewellery and this affordability can give the appearance of 'expensive looking' jewellery, without the price tag. In the mid 20th Century, various designers made costume jewellery popular, including Crown Trifari, Dior and Chanel; and come the 1940s/1950s, leading female stars often wore endorsed pieces produced by these designers. Antique costume jewellery is very collectable today, particularly signed pieces, and are of particular interest if the quality is still apparent. Paste set jewellery is often found amongst antique costume jewellery and, when set in gold, can be sold for a high amount at auction. For example, an early 20th Century gold and blue paste set riviere necklace sold recently at one of our fine art sales for £1,550. Good quality costume jewellery is always saleable and particular pieces can be found in our quarterly fine sales in Exeter. General and antique costume jewellery is usually sold as a quantity of jewellery at our silver and jewellery auctions. Collectable pieces are always highlighted.